This year, World Language Week is being celebrated from March 7-13. Maybe you didn't even know it existed? Me neither just four short years ago. But our department truly embraced this opportunity to show students how vibrant and vital languages can be in our world. Read more about our activities, competitions and projects to get ideas for your school! One of our most popular traditions in the World Languages Department is DEFINITELY our Cultural Breakfast. It takes a lot of work in planning, but if you delegate well and promote it like crazy, it is definitely worth every minute and cent you put into it. It can boost the notoriety of your program, but more importantly it can also be a unique way to expose students to authentic foods and customs. We picked Thursday morning, March 19, last year. We asked teachers, staff members, community members and parents to contribute anything they could. We raved to the students about how delicious it would be. And then...we shopped and cooked and baked and decorated! 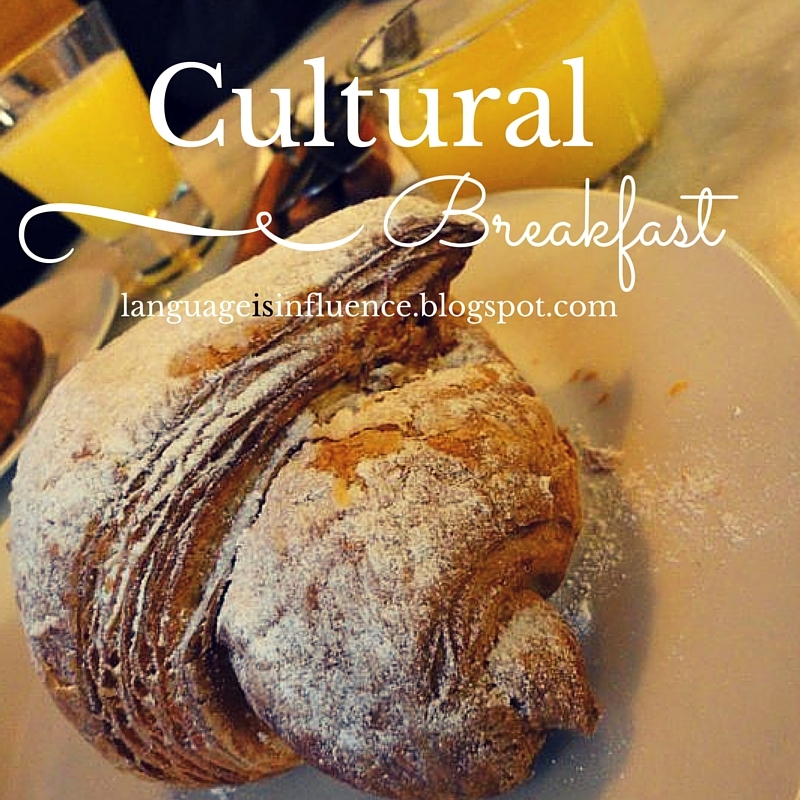 The main objective: Introduce students to breakfast foods and customs around the world. To do so, we asked each language teacher to contribute something from their target language/culture. In addition, we reached out to teachers who travel frequently, ESL teachers, and our social studies teachers who incorporate a lot of cultural information into their classes. Many hands make light work, as the saying goes, and without so many helpers there is NO feasible way to do this. Some volunteered to purchase store bought items, some asked local restaurants to donate in exchange for advertisements and some cooked up their concoctions on their own time. For those who aren't so handy in the kitchen...we also asked for plates, cups, silverware, napkins, water, hot chocolate packets and people to help serve. Everyone can help! The menu over the past three years has included the following items: tortilla española, French baguettes with jam or nutella, Chinese assorted breads, Chinese noodle salad, clatites, naranjas preparadas, French quiches, Peruvian parfaits, Mexican chilaquiles con huevos, churros, magdalenas, pan dulce, Chinese dumplings, taquitos, doughnuts, biscotti, Indian doughnut holes, Indian chickpea bread, arroz con leche, and more. To drink we normally provide water, orange juice or hot chocolate. The items are labeled with names and the culture they are from. We have also learned it is much easier to have the teachers serve the items so we can control the portions initially. Plus, it gives us a great opportunity to greet the students in our target languages! Plan ahead. Like months. Email and check in person to follow up. We meet face to face once ahead of time just to triple check. Publicize!! Get it in school emails, over the morning announcements and show videos like these two (2nd video has "a*s at 2:03 but is generally unrecognized because of everything else that is going on)in the days leading up to it in class. The more students have friends going, the more students will show up. So get them excited! Know people in your building who can help. Our head custodian provides large serving tables, extension cords/surge protectors and extra trashcans. Our cafeteria manager provides hot water carafes, chaffing dishes and a case of individual sized orange juice cups. Two teachers who have connecting rooms let us use their space to eat/serve. Many times the resources to help you are there, you just need to know who to contact. Have students sign up in advance. To limit numbers, we require students to get rides before school (not ride the bus). We also have them sign up and receive a sticker for the back of their ID card so that they can get in the door on the morning of. We have even played around with the idea of charging students and collecting it for our World Language Club budget or to give to a local charity, but we haven't done so yet. The bottom line is your teachers and community members need to know if they are making food for 15 students or 200. Have adults serve. Have adults mingle. Have adults. Lots. Period. Prepare a simple slideshow to have in the background as students are eating. We have trivia questions about breakfast traditions/foods around the world as well as how to say "Good morning", "Breakfast" and "Delicious" in each language. You can even turn on some authentic music! Have "Thank You" signs in all represented languages and take pictures of students holding those signs and stuffing their faces. Then, print cheap "Thank You notes" and distribute to servers, cooks, and support staff. Apply for grants. You can get teachers and staff reimbursed for their contributions to your meal...that might make you even more likely to get more volunteers in the future. Invite the big wigs! Have your administration and Central Office staff come and see what your program does for students. They love free food, and you might love the publicity! Take pictures. Post them on your school webpage, give them to your yearbook editor, put them on your class Instagram and save them for publicizing for the next year. You might be thinking: It's way too late to plan something for next week, Maestra! Agreed. Don't do that. But it's not too late to organize something small for the last part of the month. Your school can adapt to create its own World Language Week at a time that doesn't interfere with standardized testing. This year, I am helping out at the high school's breakfast that will be taking place March 30. I'll be posting pictures and reflections after that! Do you do something similar at your school? If not, what would you bring?